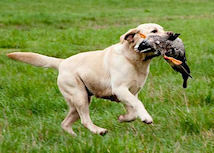 Merganser Labrador Retrievers, LLC is leasing Am GCH-CH/Int CH Breton Gate Phoenix JH, CGC, WC (Zip) as a stud dog. Zip is an AKC Show Grand Champion and an International Show Champion. Zip has achieved 8 Best of Breed in AKC show competitions. Dianne handled Zip to a Junior Hunter title in four passes without fail. Zip also has a Canine Good Citizens and Working Certificates. Zip completed the Skills and Aptitude Screening for Pet Partners Therapy Animal Program in June 2013. Zip's conformation is superb – broad head, otter tail, good not overdone bone, and wonderful athletic movement. Zip runs hard in the field and is a strong fast swimmer. Zip has an easy going temperament. He gets along well with other dogs, adults, and children. Zip weighs 92 pounds and stands 25 inches at the point of the shoulder.